Troubleshooting a remote is a more common issue as it applies to most ceiling fans, not just Harbor Breeze ceiling fans. Remotes can stop working for a variety of reasons. The troubleshooting to try is common as it applies to different fans. There are some steps to try troubleshooting the remote. Here are the common steps to try in terms of troubleshooting. Try checking the batteries. The batteries are the most common place to start. Replace them, even if you replaced them already recently. If replacing the batteries does not work, check the remote. Is there a light that normally turns on when you are using the remote to send a signal? Is the light still turning on or not doing anything at all? If the light is not coming on than the remote is not sending a signal. If the remote is sending a signal, check to see if the fan and the remote are set to the same frequencies. This can usually be done by checking the dip switches. they need to be set the same way on both the fan and the remote. If the fan won’t turn on and the lights are working, then there is power to the fan. Check the reversing switch. Make sure the switch isn’t in between positions. Try putting it in forward and reverse to see if either mode works. If the fan looks like it’s trying to turn and there’s a bad groaning sound, or smoke, turn the fan off immediately. You have a problem with the motor. If there is no power coming to the fan lights and there seems to be no power at all, there could be an electrical short within the fan housing. The same goes if there is power and the fan still won’t turn at all. You’ll need to open up the fan housing and check the electrical connections. Make sure before you do any work to the internal wiring of the fan, that you shut off power to the fan from the circuit breaker (not just the light switch). Once the power is completely shut off, open up the fan housing and take a look inside. See if there are any connections that have come loose. If you know how to use a multi meter to check the circuit, try doing that as well. Here we have posted a replacement remote. 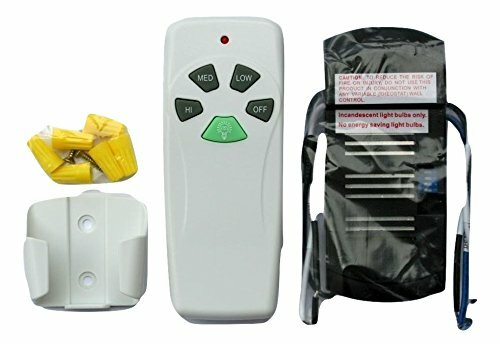 This remote will control both the fan as well as the light kit that is attached to the fan. The fan controls generally include forward, reverse, and the speed controls which are slow, medium and high. A fan remote is often the most misplaced accessory when it comes to ceiling fans, because like a tv remote, many people in the home may use it. Not everyone puts it back in the spot that it should be, either. And of course, sometimes the remote gets lost in the couch, too. At least it does not cost a lot to replace the remote!